The first time LoriAnn Natsyn talked on the phone with Joy Patrick-Akpan, a bank operations manager from Lagos, Nigeria, who’s enrolled in the doctoral program at Grand Canyon University, she was impressed. Then, after they chatted about once a month, she met her in person at the recent doctoral residency at the Pointe Hilton Squaw Peak Resort. Joy Patrick-Akpan was a graceful presence at the recent doctoral residency. What makes that even more amazing is that Patrick-Akpan’s daily schedule would leave most people feeling mashed. Just the 37-hour trip from Africa to Arizona alone would have been enough to send the average traveler into a jet-lagged frenzy, but Patrick-Akpan looked and acted as if her first trip to the United States was more like a walk in the park. And you know what? Compared to the life she leads in Lagos, maybe that’s how it felt. On workdays, the mother of four boys does her doctoral assignments from 11 p.m. to 2 a.m., after she spends time with her kids and gets them off to bed. After she got home from the bank between 9 and 10 p.m.
After she endured a three-hour commute home. Yes, three hours. With no traffic, it’s a half-hour drive. After she worked all day with virtually no break in a high-stress job that got going around 7:30 a.m.
After she got up at 4:30 a.m. and left by no later than 6. Wait until 6:30 to leave, she said, and you’ll just be joining the gridlock. How can the traffic be that bad? Check out this story and keep it in mind the next time the freeway is backed up for a few minutes. The irony here is that Patrick-Akpan has had to show so much discipline in the way she maneuvers through life without any mishaps. 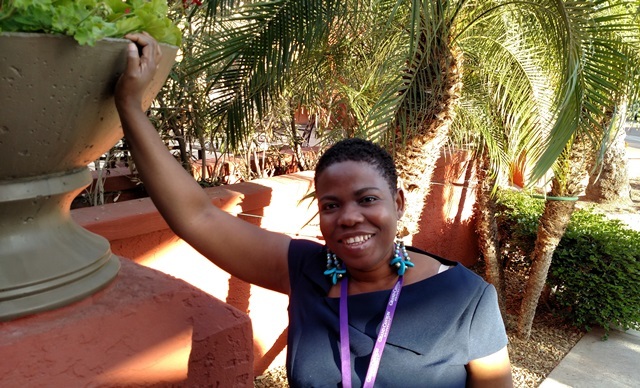 Patrick-Akpan got her master’s degree in human resources management and development from the University of Leicester, one of the oldest and most respected universities in Great Britain. She also has a master’s in business administration from Federal University of Technology, Owerri, in Nigeria, and she got her bachelor’s in education chemistry from the University of Nigeria Nsukka. When she wanted to get her doctorate, she scoured the Internet until she came across GCU, which fulfilled both of her goals. Patrick-Akpan, who has worked for the bank since 2009, isn’t looking to turn her next degree into something that will benefit her career. Instead, she wants to use it to help other people. Her dissertation is titled, “The Relationship between Employee Empowerment and Customer Satisfaction in the Nigerian Banking Sector,” and she hopes to graduate in April 2017. Just as Thorne and Natsyn have been impressed with Patrick-Akpan’s work ethic, she has turned it into a mutual admiration society. “The GCU support is really wonderful,” she said. “All the people I’ve had the good fortune to work with, they are very supportive. I could pick up the phone and call someone and say, ‘I am having this problem,’ and they get a solution to it. You are not placed on hold here, you are not asked to call back. That certainly is not the feeling she has during all those hours she sits on Lagos roads. There are many stories of doctoral learners who go to great lengths to finish the work, but it’s hard to imagine having to change lanes more than this. “She’s just one of those people,” Thorne said. Joy is really a tough one despite all the challenges, very inspiring story and I sincerely wish her the best in this doctorate program.